The Quadruple Tourbillon Secret represents a special link between Robert Greubel, Stephen Forsey and the collector. The ultimate refinement, this timepiece evokes to the passionate enthusiast the promise of an exceptional movement in which a magical mechanical ballet plays out on a hidden stage visible only through the display back. The dial side redefines the expression of telling the time with its harmonious arrangement of multiple dials. Ultra-exclusive, the Quadruple Tourbillon Secret comes in a unique edition of eight pieces in 5N red gold and eight pieces in platinum. The Quadruple Tourbillon Secret redetermines the expression of time which plays out its many paradoxes. A play of seduction in which fantastic mechanisms are subtly revealed by indications imperturbably bearing witness to their existence; a play in which a contemporary dynamic is created by overlapping curves within curves, in which symmetry gives way to asymmetry. The ultimate in refinement, the ballet of the tourbillons is visible only through the synthetic sapphire crystal display back. This private micro-mechanical performance becomes a witness to the bond that unites the owner with the values of Greubel Forsey. A bond further strengthened by the precious exclusivity of the Quadruple Tourbillon Secret. 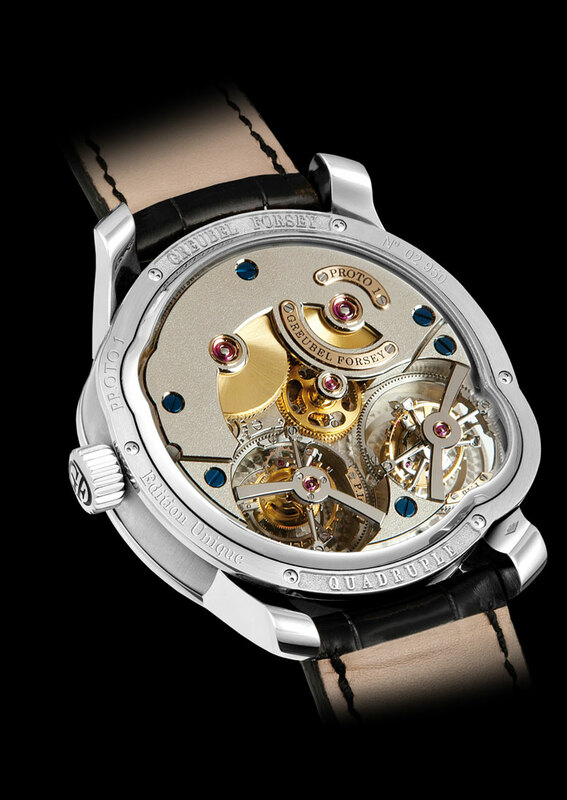 This timepiece houses Greubel Forsey’s second fundamental invention, the Quadruple Tourbillon: a reliable high-performance mechanism comprising four tourbillons configured in independent pairs, which are linked by a spherical differential that averages out any timing errors between the two regulators. Particularly in stable positions, timekeeping accuracy is improved by the Quadruple Tourbillon. The movement comprises 519 components of which 261 make up the four tourbillon cages and is powered by two mainspring barrels which provide an effective power reserve of 50 hours. The oscillators feature variable inertia balance wheels, Phillips terminal curves and beat at 3Hz/21,600 APH. The plates and bridges are in nickel silver finished in nickel-palladium with straight-grained and spotted finishes and hand polished bevels. The dials are in blackened or silvered gold with applied indices. 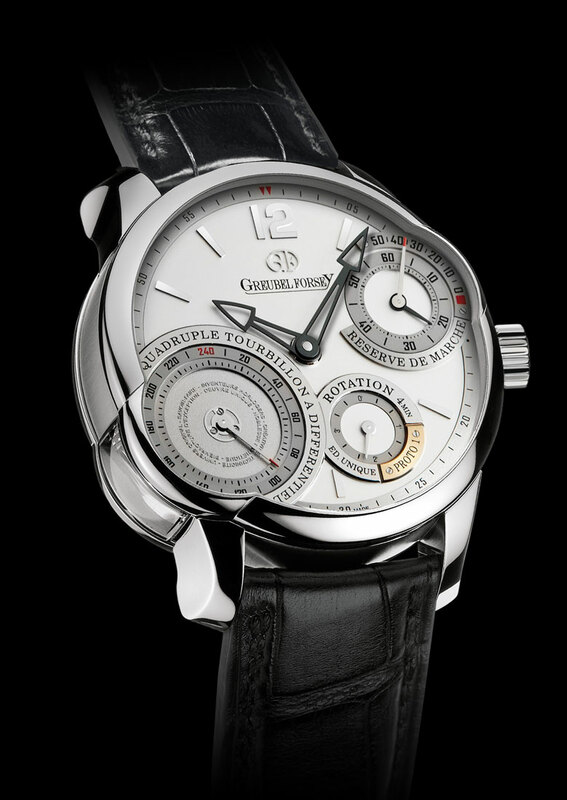 The case is available in platinum 950 or 5N red gold and measures 43.5 mm in diameter by 16.11 mm high and features asymmetrical domed synthetic sapphire crystals on the dial side and for the display back. The black alligator strap is hand stitched with a folding clasp in platinum 950 or 5N red gold to complement the case.